“Open Door” weekend at Oxford means just that: All those doors you have been peeking through are thrown open for free visits to the colleges, the Town Hall, the castle and on and on. Carving at the Lincoln College chapel. For us, that meant 6.6 miles of walking and visits to Exeter, Lincoln, Queen’s and Magdalen Colleges with a quick walk through Mansfield College on the way home. 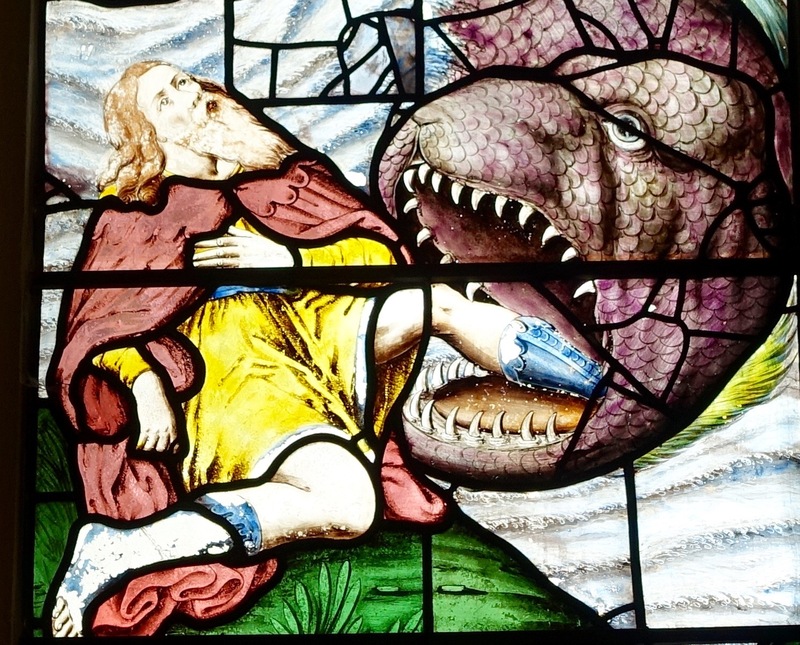 Stained glass detail: Jonah and the whale. Maybe it’s because it was the first one we visited, but the chapel at Exeter (in video above) stood out to me as the most ornate and beautiful. Stained glass, arched ceiling, wonderful wood carvings and music playing, which helped set the mood. 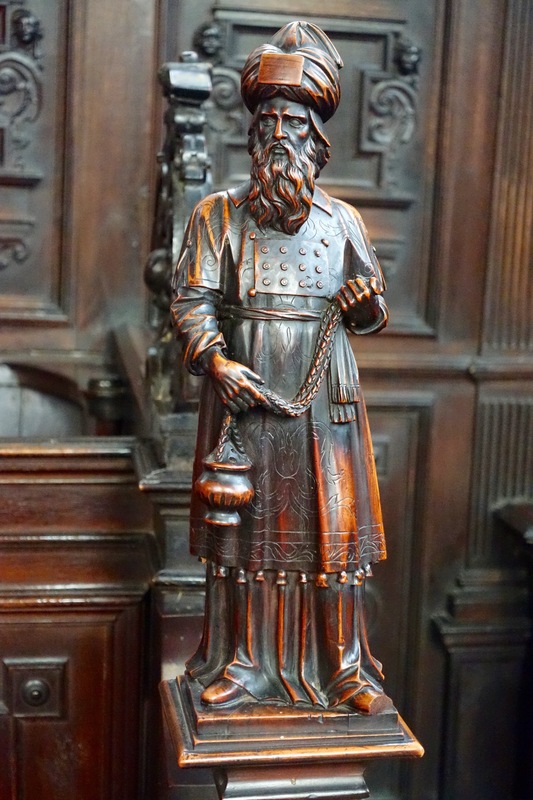 Choral Evensong on Tuesdays and Fridays is open to the public until term starts on Oct. 10. Then, a docent told us, all is chaos. 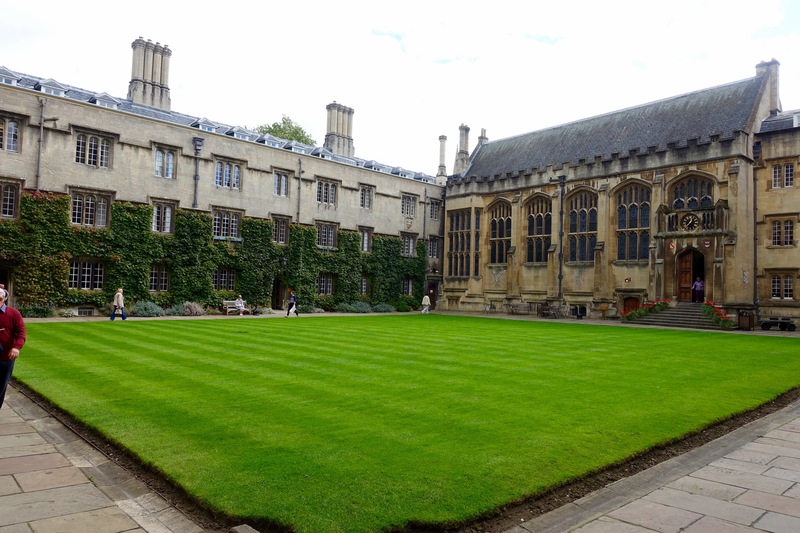 The Lincoln College quad. Stay off the grass is the rule at all the colleges, but what a wonderful spot for croquet. 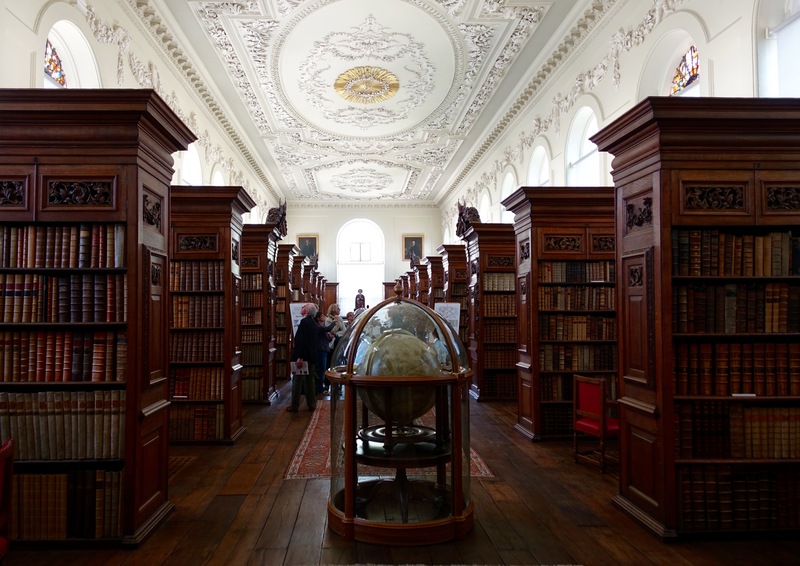 The Upper Library at Queens College, purported to be one of the best rooms at Oxford. On to Queens College where the Upper Library is packed with books, including a first folio of Shakespeare’s works, a globe that has the Pacific Northwest marked as “Nova Albion” and an orrery, a mechanical device that when cranked shows the positions of the Sun and planets. Trouble is, only two people are allowed to crank it, and one of them, the Queen Mother, is dead. That leaves a professor in one of the scientific fields, and he was not on duty today. 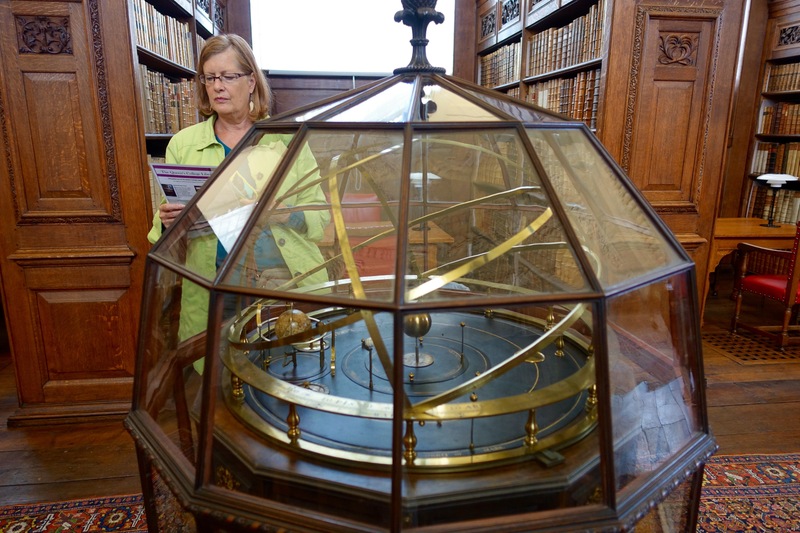 Ornery with the orrery at Queens College. Magdalen College has its doors open every day, but today was free. So we wandered the grounds there, visited the chapel, walked along the college deer park and checked out the Riverside Cafe, which overlooks a punting concessionaire where boats were in chaos today. Looking forward to poling down the Cherwell on another sunny day, but I can see that steering a boat with something more appropriate for pole vaulting might not be an easy task. Several of the boats below the cafe were bow to bow and making little progress up or down the river. Just wait til I get out there and do my Mike Fink imitation (I think Mike transported the Wesley brothers when horses gave out. Could have that wrong though). Wandered home, put up our feet and ate leftovers. Didn’t add a favorite pub today. Probably because of the Wesley influence. 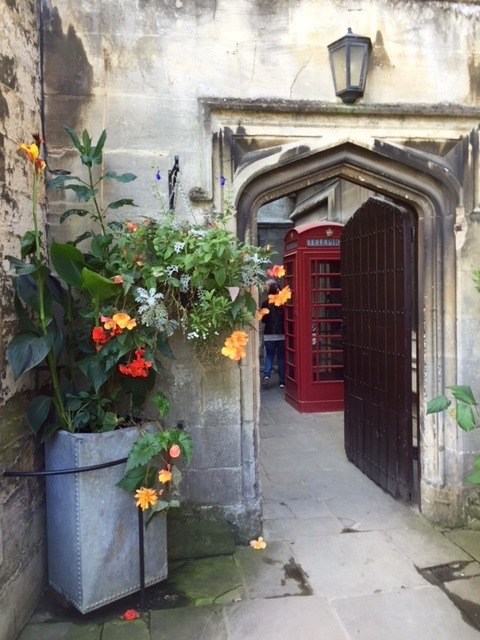 What could be more English: flowers, a red phone box, ancient walls inside Magdalen College at Oxford. Posted on September 12, 2015 September 12, 2015 by jbsaulPosted in TravelTagged Exeter College, Lincoln College, Magdalen College, Methodist, Oxford, Queens College, Wesley.